Games seem to get bigger and more complex every year: more levels to explore, more enemies to fight, and more stuff to collect. And as 2017 showed, there’s now more stuff to buy than ever before as well. This year saw the culmination of a trend on consoles arguably started with Overwatch. Blizzard’s hero-based shooter was $60 to buy at launch but also included a loot box system where players could pay additional money for a chance to track down their favorite cosmetic skins and accessories for their characters. Not interfering with actual gameplay, the inclusion of microtransactions in a full-priced game left many unphased. In 2017, however, other publishers decided to push forward by not only adding microtransactions to single-player games like Middle-earth: Shadow of War but also letting the stuff players purchase affect gameplay, as in Destiny 2 and, most infamously, Star Wars Battlefront 2. As a result, conventional, single-player campaign games like Tom Clancy’s Ghost Recon: Wildlands have in-game economies much like free-to-play MMOs, such as Warframe. In some instances the inclusion of microtransactions has been touted as a way of doing away with paid DLC and Season Passes, as EA argued when Battlefront II was first released. Outside of debates around how they influence game design, create an uneven playing field for players, or prey on people’s desires to get the next shiny thing, one thing’s clear: in-game purchases have gotten more diverse and weird than ever. Microtransactions come in all shapes and sizes (and bizarre names) and with an aim to capturing their increasing breadth, we’ve collected a handful of them from throughout the year. Below is just a brief recap of all the different types of stuff you could buy in some of this year’s most popular games. Believe me when I say it doesn’t even begin to scratch the surface. If you have your own favorite in-game purchase or weird microtransaction perk, be sure to share it in the comments. 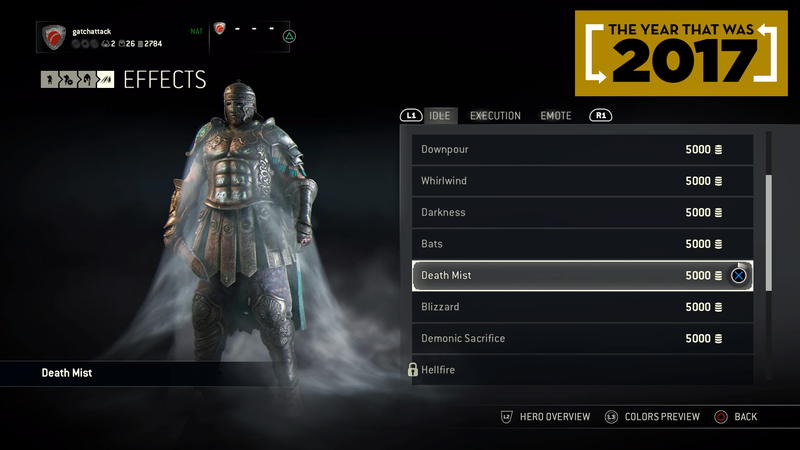 Item: Death Mist that shrouds your warrior in a fog...of death. Cost: 5,000 Steel or $5. Item: A Krogan Vanguard and whatever else comes in the premium pack he was hiding inside of. Cost: 300 Andromeda Points or $3. Item: Last Chance Ghost Pack. Includes a sniper rifle, jacket, boots, hat, sunglasses, and a monkey patch for your backpack. “Remind your foes that crossing you is a gamble with the devil,” reads the description. Cost: 2,100 Ghost Credits or just under $15. Item: Camo Dolphin gun charm as part of the Mute Gravel Blast Set. Item: Flying pig tattoo from the Alley-Oops Tattoo parlor. Cost: 1,500 credits or $0.40. Item: Pack of 20 Yogwun Stomachs that you can use for crafting or just to show off to all your friends. Cost: 8 Platinum or approximately $0.50. 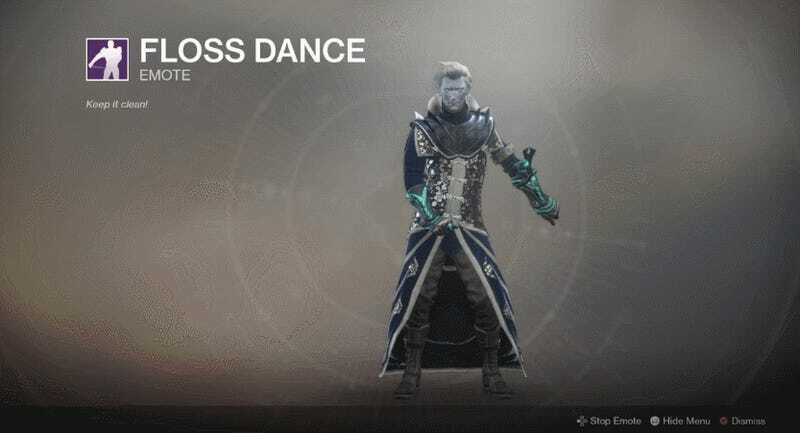 Item: Legendary Floss Dance (“Keep it clean!”) emote. Cost: 700 Bright Dust or around $5 to $10 worth of Bright Engrams. Item: Tom Nook’s Chair. “Buy his chair and you can have Tom Nook visit your campsite anytime!” says the game. Cost: 250 Leaf Tickets or $11. Item: Orcs in a box, otherwise known as an Assassin’s War Chest, including three Orc Assassins, two consumables, and two hours of Spoils of War boosts. Cost: 240 gold coins or $2.50. Item: Unicorn, a creature the game describes as being mysterious and from a faraway land but totally fabulous. Cost: 500 Helix Credits or $5. Item: Dark Lord of the Sith. Cost: 10,000 credits (which as of November 17 can no longer be purchased with real money).